I soaked my peas for 12 hours used hot water drained it off when it cooled took them three days to sprout. The potatoes are up. But everything is slow, so I am not to worried yet. It's just usually they beat my pumpkins, squash, cucumbers, etc. This is how the sweet potato plants came in the mail. I planted them and it's been about a week and half of them are dead. I planted them in the orchard because I didn't realize they spread out and were vining. Didn't have room for that in the garden and thought I would try them in tires. I planted the rest of the tomatoes and peppers that didn't fit in the garden in pallets. I have pictures but for some reason, it says the picture is to big. we had that problem before and the webmaster fixed it. Your file size is probably bigger. You can upload to photo bucket or a site like that and download the link. Photobucket is so slow. But here is the orchard. 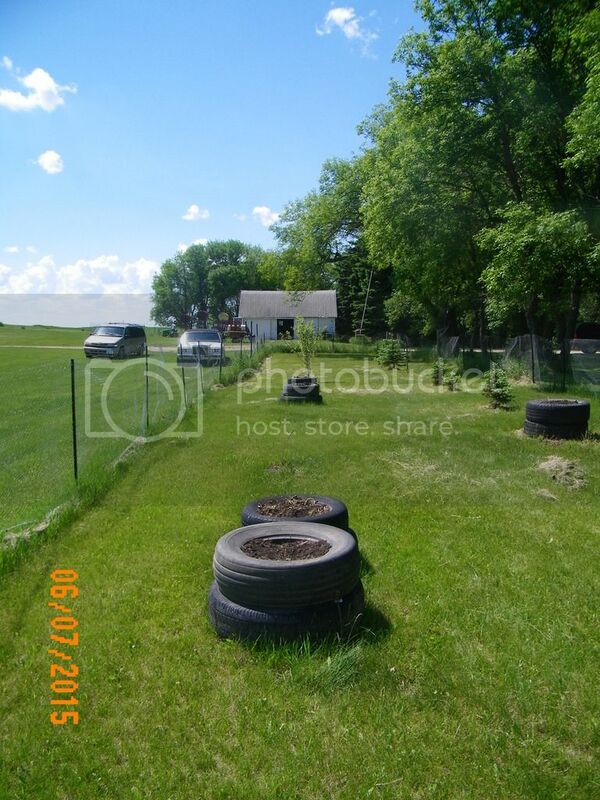 Here is the tires with sweet potatoes, that I looked at today and decided to plant corn in the ones that are dead so that I can make into corn meal and hope it is far enough away that it will not cross pollinate with my garden corn or the neighbor's field corn. Here are the pallets. They are not very straight but squeezed in between the raspberries and fence. So most of the garden is up. I re-planted peas after soaking them overnight and they were starting to sprout, when I put them in the garden on Sunday. But no peas yet. 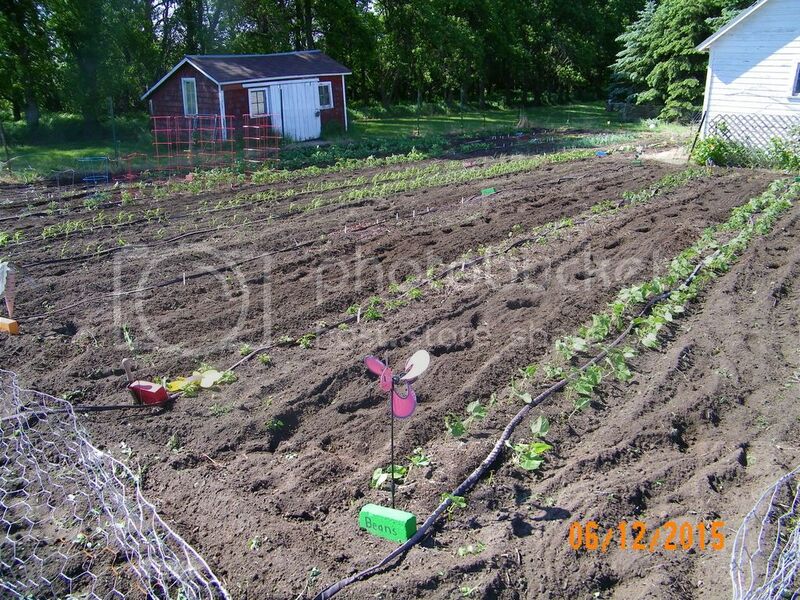 I did the same with the corn that I planted in the tires where the sweet potatoes died and they are up today. So maybe no peas this year. I might try again and leave them sprout longer before I put them in the ground. Looking good. Good moisture and it will take off. Closest to the gate or fence is beans. Yes I have PETC. (Plant Everything To Close). Then it is a row of different Hot Peppers. Then half of a row of flowers, which are sproratic and peas that are still not coming up well. I replanted some flower seed earlier this week and threw my pea seed away. The third sprout test I did was terribly poor. 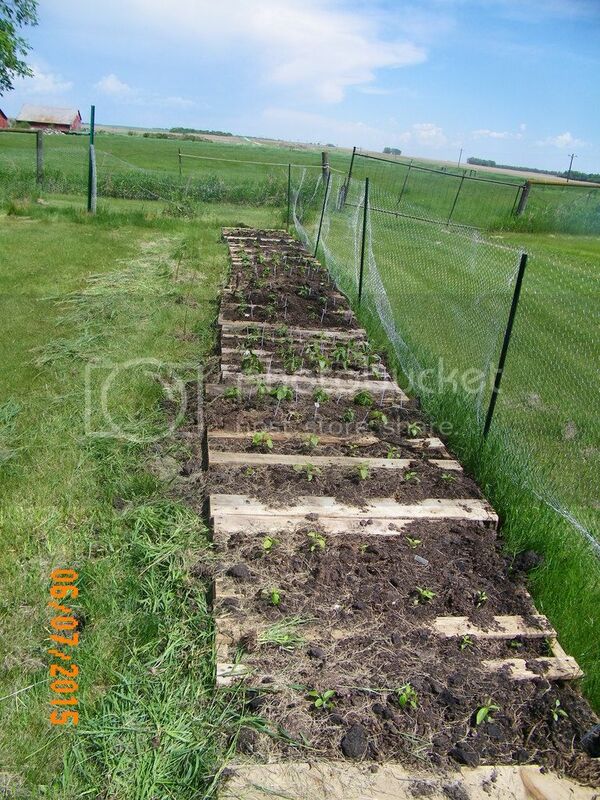 The row closest to the fence in this picture is cucumbers then potatoes. 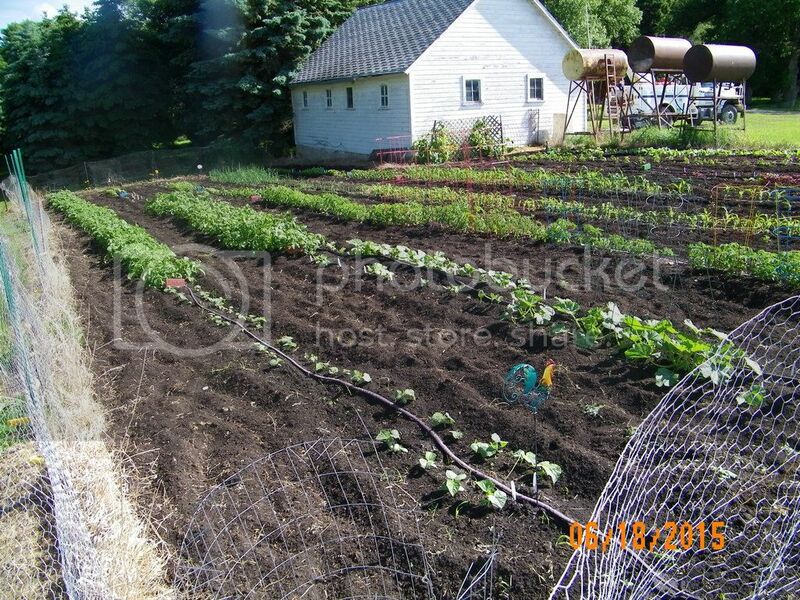 The next row has pumpkins, squash etc. and more potatoes, green peppers and then herbs. Then it is mostly tomatoes with paprika peppers and more herbs. The middle two rows have corn and herbs and onions. The poor germination on the one spot of corn is seed I got from a company two years ago. It was great last year and I saved seed from it and this year, when I used up the company seed I filled in the ends with my seed. Apparently it lost lots of germination and I should have planted more but it will work. I still have lots of corn canned from last year. Looking south, At the end of the onions is where the horseradish and I are fighting it out. I havent' knocked it out yet but I am ahead so far. I got the electric fence going because about 50 ft from the garden, we have been catching raccoons in the live trap. At night the dog has been chasing around a skunk. He doesn't get spray but the yard does. 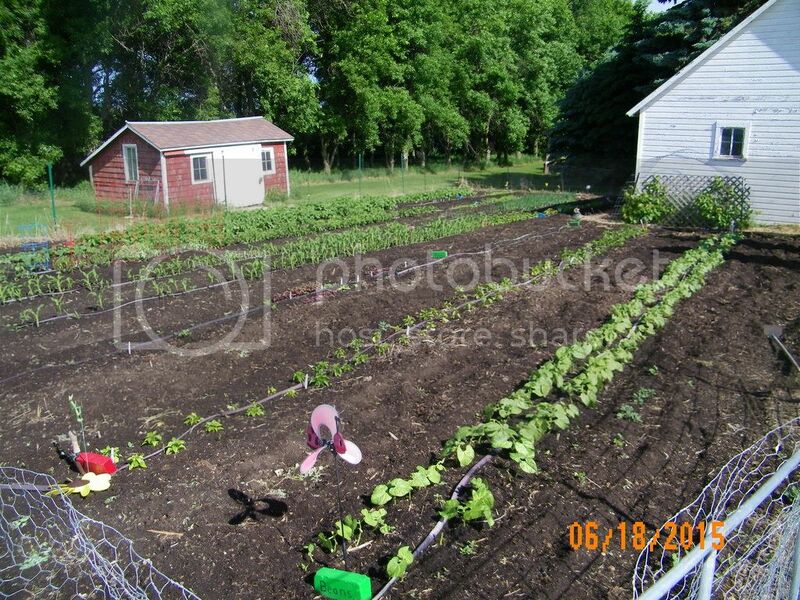 I know the placing may seen a little crazy, I am trying to rotate crops and deal with the shade from the white garage in the morning and the shade in the afternoon from the red gardening shed and the trees. Wow, that's great. Are there three of you? How do you take care of all of that? HaHa. No just me. To tell the truth I haven't been in there to weed for a week. I planted a little more. 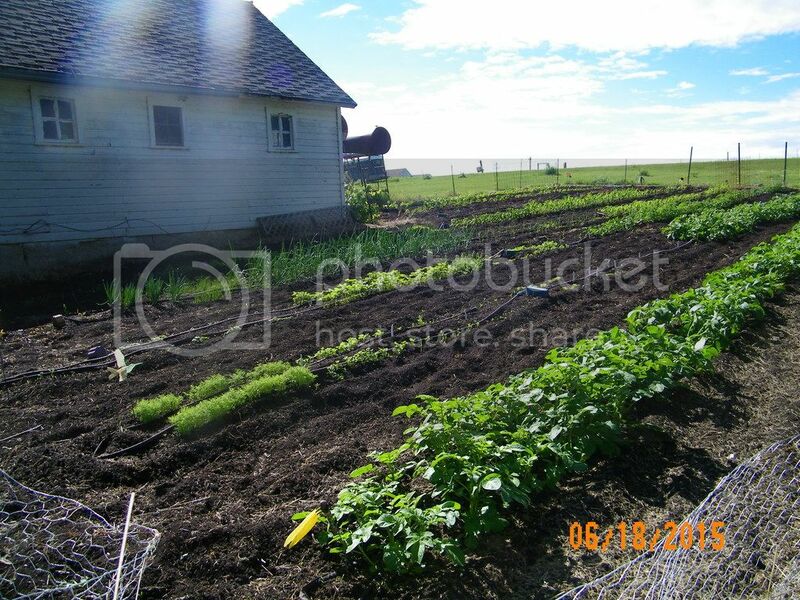 But the week before I took two hours a day and got it weeded and tilled. It should stay ok until I need to start hilling stuff up. I might get the tiller in one more time before my rows become to crowded. If we stay dry, the weeds should not be to bad in the walkways. With the soaker hoses I don't spend any time watering. 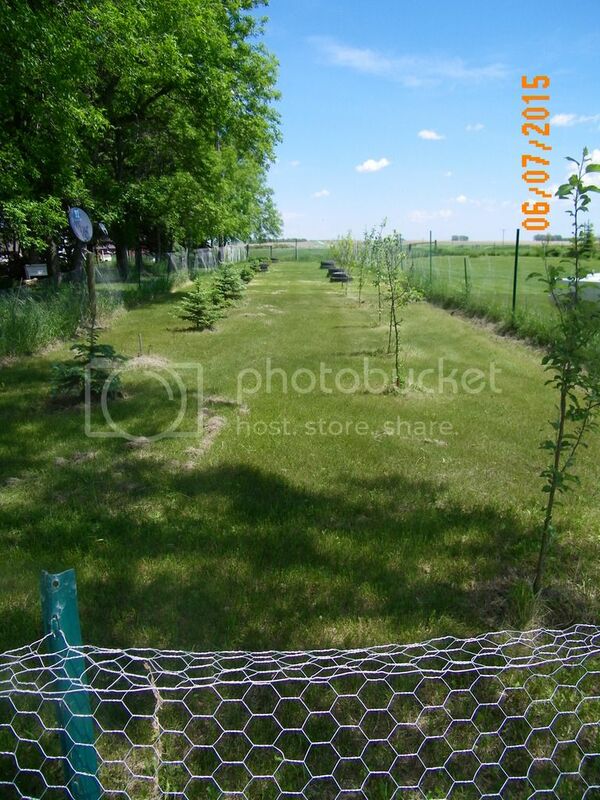 Except now I have to hand water in the orchard where I planted all my extras. I don't really like that and hope I have learned my lesson on being crazy with transplants. Well I keep putting off going out and mowing the lawn which was put on hold while I was tending garden. I extremely dislike mowing around trees. Hoping my dear husband finds a moment this weekend to trim some branches that not only poke me in the eye but try to take me off the mower. So I found out that my peas were probably germinating but being eaten as they came up. Because the last few days each night we were getting about .10 of rain, so I wasn't going to the garden except to do a glance over. Today I find the 15 peas that had sprouted and came out were eaten to a stub. So I am going to get more seed. My cats and dogs can't get in because I have it fenced to well so I guess I will have to trap or as a last resort poison which I don't like because of the cats and dog. But not sure how one can trap mice in a garden. I do have a live trap box for mice but usually I put that along a wall. I thought bugs had eaten the mustard greens but know I think that too was mice. I need more cats and my mamas are a working on it but ugh!! One year I planted peas as dry seeds and they were dug up and eaten in matter of hours along with corn -- neatly dug up from EACH INDIVIDUAL HOLES. In my case, the culprit was chipmunk. I've sown them pregerminated with success since then, and have taken one step further to grow them into little seedlings to transplant -- corn since two years ago and peas this year as well. ..but in your case, they are eating germinated seeds? Ugh! I used to blame magpies for eating freshly planted seeds: peas, corn, beans. The worst, oddly enough, sunflowers. Rabbits are the most common pests in my garden. Digging up a seed, I don't think that would be too difficult for them. They have their preferences when plants are above ground, broccoli and beans are highly rated on their menu. Perhaps, your fencing is tighter but I have seen cottontails climb right through chain link fencing. Funny thing is, since I moved here I have not seen a rabbit of any kind. Not saying they are not around but my dog would find them too fun. We also have many foxes and coyotes that keep picking off my poor cats. I tend to see them, as I am driving down the road and almost home and of course with out a gun. Some of the neighbors have had there calves taken. Anyway back on topic, I don't think it is a rabbit. But could be mice, striped gophers, birds of any kind. We live next to a lake that is a refuge so lots of birds. Would garter snakes eat plants, I found skins in the garden? Would squirrels chew the pea down to the ground? Squirrels tend to be more messy, usually, tearing stuff up out of the ground, etc. Right? I went to the garden this morning, right after milking but before the 2 to 3 hours of other chores, to check on the ladybugs I delivered last night to the garden, which is another story and found a morning dove eating what was left of the pea stems. I can not put netting over my entire garden or even try to get rid of the birds. How disappointing! Why couldn't it be a gopher? Whey just the peas? They have fields of crops to eat. Go away. So now I will be looking up some, do it myself scarecrow thing to try and scare them away. Maybe put some netting over the peas.